Ok ladies, the hunt is on for some Jimmy Choos! Got this in my inbox today and it’s too delicious not to share. Hangbags at the ready, there are some Choos at stake! 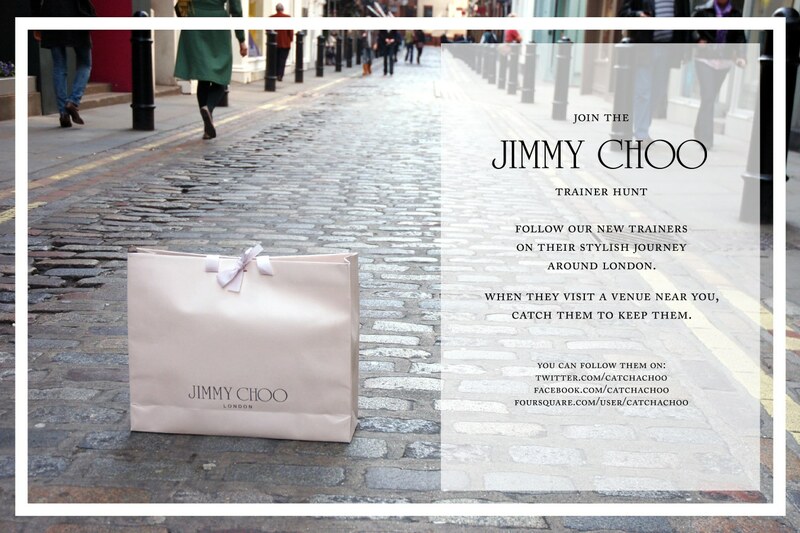 To celebrate Jimmy Choo’s first trainer collection, they have launched a city-wide treasure hunt giving you the chance to win a pair of their new trainers!! All you have to do is follow the elusive Jimmy Choo trainers via Twitter/Foursquare/Facebook (links above) as they make their stylish journey around London. The trainers will update you on their whereabouts in real time, be it the Saatchi Gallery or Shoreditch House, the trainers are said to have an uber-stylish journey planned. And if they check into a venue near you, you can catch them to keep them. How amazing is that! I’m not really down with Foursquare, but I’ve tweeted Catch-a-Choo on Twitter and hope to bump into some trainers on my travels this weekend. Shoe-excitement aside, I think this is a prime example of how companies should be harnessing social media. Rather than building Facebook pages or Twitter accounts which don’t engage with the consumer, Jimmy Choo are really trying hard to create a buzz. This is soooo cool! Are you going to do this? Those are nice looking sneakers, for sure! OH-MY-GOD! I want them so so much! Well!Nice Collection of trainers and brown one is really stylish and perfect trainer.